In the late 19th century, the popularity of carbonated drinks and mineral waters led to a huge demand for sealed glass bottles that would keep the liquid fizzy and fresh. 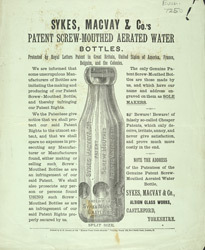 Companies such as this one made many different bottles, trying repeatedly to come up with the perfect design. This screw-bottle design is strikingly similar to its common modern counterpart. Here the manufacturers are complaining that other companies have broken patent laws in copying it.